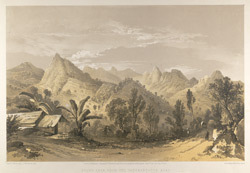 Lithograph by Jonathan Needham (fl.1850-1874) Charles D.C O'Brien, of 'Adam's Peak from the Yatteantotte Road'. This print forms plate 6 of 'A series of fifteen Views of Ceylon illustrative of Sir J.E. Tennent's work, from sketches made on the spot by Capt C. O'Brien, late Assistant Surveyor General, Ceylon' London, 1864. The text accompanying this image reads, "Adam's Peak...forms the most striking object in every view from which it is visible. Here it soars over a range of wild and almost inaccessible country, singularly in keeping with its cone-like form. Through this rugged region the pilgrims to its distant shrine have traced their winding path...The river Calavy is seen glittering in its fall, as it leaps its barrier, and plunging into the gorge, foams along a rocky course till it reaches the village of Yatteantotte, when it becomes navigable for boats laden with rice from Colombo. With the exception of occasional rapids, which cause detention in the dry season, and are somewhat alarming when in flood, the river now flows tranquilly till it reaches 'the bridge of boats' in Colombo. The numerous coffee estates in Ambogammoa are connected with Yatteantotte by a splendid cart road, of twenty-six miles, from the top of the pass." The mountain of the Holy Footprint or Sri Pada, in the Ratnapura district, has been a place of pilgrimage for hundreds of years for Buddhists, Muslims and Hindus as it is believed that Buddha, Adam or Shiva left his footprint on the mountain-top.